Wall was born in Carlisle, PA in 1760. Her father was a prosperous farmer “of a serious and devout turn of mind.” Every day, he gathered his family together in the morning and in the evening for prayer, and on every Sabbath he spent the night quizzing his children on the Holy Scriptures and other pious books that he read out loud to them. Wall found this environment to be oppressive and ran away at a young age. She returned a prodigal daughter and stayed with her family for two more years. But she left her family once again when she eloped with George Wall and never saw them again. At one point, Wall’s husband landed in prison for theft. Wall baked him a loaf of bread that contained a saw, a file, and some other tools. The jailor unsuspectingly passed the bread to Wall’s husband, who then used the hidden tools to fashion an escape. Unfortunately for him, he was caught before he could carry out the couple’s plan to free him. Not long after this episode, Wall’s husband abandoned her, and she never saw or heard of him again. Even though Wall was no longer under her husband’s influence, her fall from grace at this point was complete. She later admitted that during the period immediately after her husband left her, she was “guilty of a great many crimes, such as Sabbath-breaking, stealing, lying, disobedience to parents, and almost every other sin a person could commit, except murder.” Indeed the crimes she committed were so numerous that she could not mention them all in her confession. 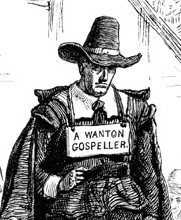 In 1785, Wall pled guilty to stealing goods from attorney Perez Morton. As punishment, Wall was ordered to pay triple damages of eighteen pounds, receive fifteen lashes, and pay court costs. Unable to pay the fines, Wall was sold into servitude for three years to help cover the amount. Through the course of her servitude, Wall conducted “nocturnal excursions” where she crept aboard ships moored in the Boston harbor, entered the cabins of the officers, and plundered their possessions while they slept. She would then spend the money she acquired “in company as lewd and wicked as myself.” Many years later, these acts of theft may have had a hand in building her modern-day reputation of being a female pirate, even though no evidence is ever cited to verify the fact. In 1788, exactly three years after she was sold into servitude, Wall was caught attempting to rob the house of Lemuel Ludden along with two other accomplices. Wall pled guilty to housebreaking and theft and was sentenced to pay Ludden 24 pounds, sit on the gallows for one hour with a noose tied around her neck, and be whipped. Wall was once again offered up for sale as a servant, since she was unable to pay the fine. Wall now made her third appearance in front of the Supreme Judicial Court, although unlike the other times, she pled not guilty. Nine people testified that they witnessed Wall’s capture and saw Bender’s bloody mouth, but only Berry positively identified Wall as the attacker who was running away from the scene. Wall’s court-appointed attorneys argued that Wall was not holding the bonnet when she was taken, so the charge against her should at least be reduced to attempted robbery, a noncapital crime. But the jury rejected the lawyers’ arguments and found Wall guilty of highway robbery. In one of his last judgments before becoming a U.S. Supreme Court Justice, William Cushing sentenced Wall to hang by the neck until dead. Wall was hanged the following day in the Boston Common. She was the last woman executed in Massachusetts, and along with the two other criminals next to her, the three were the last to be executed in Massachusetts for highway robbery. 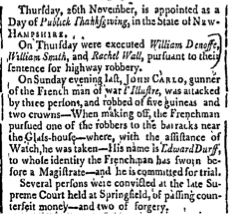 “Boston, Sept. 19.” Pennsylvania Packet, September 28, 1785, issue 2074, p. 2. Database: America’s Historical Newspapers, Readex/ Newsbank. “Boston, September 22.” Herald of Freedom (Boston), September 22, 1788, vol. I, issue 3, p. 3. Database: America’s Historical Newspapers, Readex/ Newsbank. Massachusetts Centinel. September 12, 1789, vol. XI, issue 52, p. 205. Database: America’s Historical Newspapers, Readex/ Newsbank. Massachusetts Centinel. October 10, 1789, vol. XII, issue 8, p. 31. Database: America’s Historical Newspapers, Readex/ Newsbank. O’Toole, James M. and David Quigley. Boston’s Histories: Essays in Honor of Thomas H. O’Connor. Boston: Northeastern University Press, 2004. Wall, Rachel. Life, Last Words and Dying CONFESSION. [Boston, 1789]. Database: America’s Historical Imprints, Readex/Newsbank. Williams, Daniel E. Pillars of Salt: An Anthology of Early American Criminal Narratives . Madison, WI: Madison House, 1993. This was written by Anthony Vaver. Posted on Wednesday, March 7, 2012, at 12:21 pm. Filed under Criminals. Tagged Execution, Fines, Imprisonment, Massachusetts, New York, Pennsylvania, Piracy, Punishment, Robbery, Theft, Whipping. Bookmark the permalink. Follow comments here with the RSS feed. Post a comment or leave a trackback.